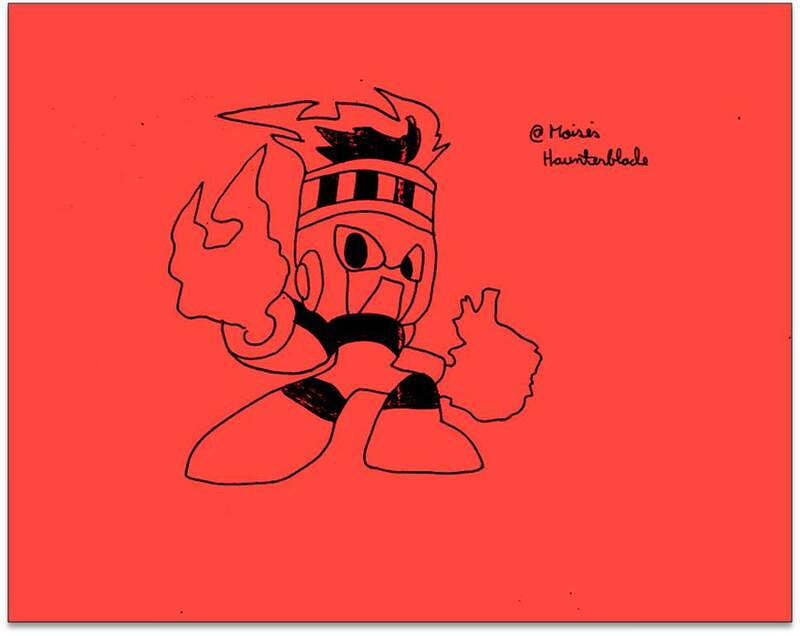 (Drawing projects) Firem (Mega man serie). Fire Man is a Master Robot created / designed by Dr. Light to work within an incinerator to operate waste removal, manipulating flames that can reach 7000-8000 degrees centigrade. In "Mega Man", Fire Man was reprogrammed by Dr. Wily to help him in his plan for world conquest. Fire Man has the Fire Storm, a flare that releases the burners located in its arms being able to melt almost any object. A person of bad temper, although passionate and charismatic, Fire Man sees himself as a kind of hero obsessed with fire and ideals of justice, often referring to himself as the "Flame of Justice". He enjoys camping in the summer, but has a particular aversion to rainy days and cold. The weakness of Fire Man is strange, since it is a Master Robot of weak Fire to Ice Weapons, only two other Fire Chiefs, a Robot Master and a Maverick have this same type of weakness. The other Fire Manipulators are usually weak to Aquatic Weapons or Wind Weapons. Fire Man, like Bomb Man, is a Robot Master of the first "Mega Man" that has not had an appearance in videogames "Mega Man: The Power Battle" and "Mega Man 2: The Power Fighters". There is a certain similarity of powers, design and personality between Fire Man and Firestorm, superhero of the Firestorm saga of DC Comics. In addition to sharing the same name of the superhero with his special weapon, the Fire Storm. Fire Man is the only Robot Master of "Mega Man" to have the same weakness in all the games that appear. It is the first Master Robot to have a cannon arm, not to mention the first to have no hands. Although in Mega Man Megamix, Fire Man can turn his guns into hands, just like Mega Man does. It is also the first Master Robot to have a visible mouth, however in Mega Man Megamix he can open his face shield. The head of Fire Man seems to have been designed based on a torch, and resembles slightly a knight's helmet. His eyes are blue but in "Mega Man Powered Up" he has them red.